Tuesday saw the old hackers heading to what would be the nicest course we played on the trip; Tallamore. Gaining some interest a number of years ago having the option of using Lamas to carry the golfer’s bags, the idea never took off and the remaining Lamas relegated to a penned area on the back 9, inconspicuously watching the golfer’s carts wiz by giving thanks for their own new life of leisure. The 8 AM tee time barely dodged a frost delay, and although the sun made a vain attempt to peek through, the wind kept the temperatures feeling cool. The course was a tremendous layout, with many golf-friendly improvements scheduled for later this year including renovated greens, elimination of numerous bunkers and removal of hundreds of trees. The only other game improvement projects I could recommend in enlarging the cup and doubling the width of the fairways, as well as a mulligan a hole. Despite not having those advantages I did manage to post a 42/45 for a respectable 87. The snack bar was a nice setting, especially the deck overlooking #18; a great place to enjoy a beer. The food choices were minimal, with the bar-b-Que being the most highly rated by our group, but the beer was cold and the staff very friendly. Our final round was played, as always, was Highland Hills and manager Bridgett and Ozzie the amazing Border Collie. One of the most welcoming courses I’ve ever played and the course, although having just a few difficult holes, is a great layout. Bridgett helps put the entire outing together and clearly loves what she does. Better yet-my first birdie of the year (2 to be exact), my first sub 40-9-hole score (39-with double on # 9 ) and best round of the year of 83, what’s not to like; especially since golf is all about ME! The 19th hole is a typical golf snack bar; nothing elaborate, dogs, subs, chips, etc., but Bridgett always has a large chocolate cake for our group which is a great way to end a great outing! Great 4 days of golf, and already have it on my schedule for next year! I had the honor of playing in the Annual Wounded Warrior Golf Tournament at Lake of the Woods, Va. on Saturday, June 15th. The event featured 23 teams and raised over $7,000 for the Quantico Chapter of the Wounded Warrior’s Project. I play in many charitable golf outings during the year, all very worthwhile causes; however, this particular one that honors those courageous young men and women who have placed their country above their own safety needs, always touches me in a very profound way. It was a spectacular day, low humidity, clear skies, and moderate temperatures. My foursome consisted of myself, Gordon and octogenarian who’s is consistent as they come and when he wasn’t draining the first put as our lead-off putter, always gave us a clear line of the break of the putt. Dave, one of the most consistent golfers I play with, and the Lake of the Woods Club Champion in the past and always a contender and Sandy, who in addition to being the most accomplished golfer here at Lake of the Woods, I discovered is also money in the clutch- as she always split the fairway when her teammates were looking for their balls in the woods. She was won the long-drive competition in the tournament as well. My major contribution to the team was my uncanny ability to select great teammates!! We started the round with 1 eagle, 9 birdies, and 1 par making us 11 under through the first 11 holes. We stalled out with five consecutive tap-in pars in a row- before righting the ship with back-to back birdies on the last two holes to finish with a 58 and a 2 stroke margin for the victory!! The luncheon that followed was a classic make-your-own Dagwood Sandwich (for those old enough to remember Blondie & Dagwood) with potato salad, chips, etc. The ladies (Claretta, Mae and the rest) always do an outstanding job with outing and providing quick meals at the turn or when the round is over. The club pro, Rea Hardgrave is always a great host and those who were responsible for securing the many hole sponsors and players should all be commended for an outstanding tribute to the brave men and women in our armed forces. Southern Pines Golf Club – March 11, 2014. The Donald Ross designed Southern Pines Golf Club was the site of the third day of our outing in the Pinehurst area of North Carolina. Although the entrance to the facility is unimpressive, the course itself was in relatively good shape for early in the season, but recent aeration made the greens a bit tricky. The generous fairways would normally be receptive to my tee shots; however, that is assuming I could swing a club the same way twice in a row. After a double, triple, double start, my mental state apparently was a bit fragile, and I stumbled in with a pathetic 96, hopefully one that won’t count in my handicap calculations. With nothing remotely close to a birdie on my card, I felt it was time for a burger, and Mulligans on the 18th, the full-facility restaurant at Southern Pines did not disappoint. I must add that prior to our tee time, we had the humbling experience of watching a group of young golfers (pre-teen to teenage boys and girls) from a Canadian Country Club, contort their bodies and crush shot after shot down the 1st fairway, from the tips. My only thought was, “Thank goodness they’re not behind us”, watching our beer bellied, fat asses hook, pull, slice, and drop-kick, our shots down several different fairways off the 1st tee. Oh to be young again!! One neat feature of Southern Pines is that there is a concession stand at the intersection of several holes on the back 9. Poor play makes me hungry, so I stopped after Number 11 for a Chicken Salad sandwich. Knowing I was going to have lunch after the round, I opted for a ½ sandwich, which was excellent. Served on fresh multi-grain bread with large chucks of chicken and a perfect amount of mayonnaise- it was just the right portion to take the edge off the hunger, and adjust my mind to absorb three more consecutive pitiful holes, before finally making a few shots. Mulligan’s on the 18th was the relief I needed to forget about the round; a delightfully friendly staff, appropriate seating in the restaurant, deck area overlooking the 18th green, and a full-service bar. Oddly the place is decorated with lots of Ohio State pennants, flags and signs. I learned that the largest contingent of Ohio State fans in the state enjoy Mulligan’s hosting of all the Ohio State games during football season. Mulligans is open every day, even when the course is closed as it is that popular with the area residents. I enjoyed the “Mooney Burger”, a ¼ lb burger cooked perfectly served with Swiss cheese, coleslaw and chili, served with homemade, thick cut potato chips. I’ll be surprised if I have a better burger the rest of the golf season. Mt GDP’s (golf dining partners) had a triple-decker sandwich, a fried chicken sandwich, and a barbeque. All three were impressed with the quality and quantity of their choices and all were priced around $8.00. It was obvious why so many non-golfers were in the restaurant on a Tuesday afternoon, as the food was great, the atmosphere delightful and the staff incredibly hospitable, friendly and efficient. I’ll definitely keep Mulligan’s on the 18th on my short list of best golf-course cuisine, and give my highest recommendation to make it a must on your next trip to Pinehurst. Legacy Links Golf Club – March 10, 2014. 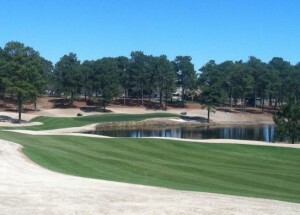 The Legacy Golf Links, a Jack Nicholas 4.5 Star Golf Digest PGA course is a track that is well-deserving of the many accolades it receives from those who play in the Pinehurst area. For the second consecutive day we were fortunate to have spectacular weather conditions; low 70’s , clear skies and bright sunshine. It was much too nice a day to spoil it with a round of 90, filled with more 3 putts than I care to remember. No one in our group seemed capable of mastering the extremely fast greens. I understand the greens were recently re-done with a hybrid grass, which left me begging for a “gimmie” for anything inside of 1 foot, since even those had a chance to slide four feet past the hole. Unfortunately every putt had to be holed out. Who makes these crazy rules anyway? The course was gorgeous, with many holes overlooking water, although little came into play, short of hitting a shot way off the mark. After carding a 42 on the front nine- including two legitimate birdie attempts on the first two holes (only made the second) I was guardedly optimistic about finishing with a strong round, but a triple, double, double start on the back 9 brought out the best of my creative, colorful self-deprecating diatribes. I still had the chance to break 90 with a par on 18, but a horrific chip shot got in the way; not too uncommon an occurrence for me. We decided, given the weather and the unfulfilled promise of the 1st round, we’d play a 2nd 18-BIG MISTAKE!!! We did; however, have the chance to grab a bite to eat at the clubhouse grill. I chose the beef brisket sandwich which came with coleslaw and French fries. Recommended by the waitress, she was spot on. The tender-perfectly cooked brisket, seasoned with barbeque sauce on a fresh bun was delicious. Dave (a GDP) chose the chicken salad, which he said had just the right amount of mayo, large chucks of chicken and fresh lettuce and tomatoes. Tom had the triple decker sandwich on toast, which he also said was tasty, but too much mayonnaise for his liking. Rea, the pro from Lake of the Woods Golf Course in Locust Grove, Va., shared that the Barbeque (Carolina style, of course) was excellent as well. All agreed that although they love shoe-string fries- these were a bit too greasy. All of the menu items were reasonably priced, well-portioned and prepared and served quickly, always critical for those hurrying at the turn. After finishing the second round, my thoughts were that we should have stayed and ate, and although the course was still picturesque and the putts still difficult, a 2nd birdie reminded me that I still need to order a burger- soon! This course will be a definite on our return trips for this annual outing. Hyland Hills Golf Club – March 9, 2014. My golf season is officially underway, and welcome to the first 2014 post to Birdies and Burgers, although my first round of the season had no birdies and not even a burger! However, after a 5 ½ Hour trip to the Pinehurst area, we (myself and 23 other golfers mostly from the Lake of the Woods area of Virginia) enjoyed the beautiful weather and friendly and gracious folks from the Hyland Hills Golf Club in Southern Pines, North Carolina. After the rough winter the course itself was in pretty good shape considering the challenges of the cold and snow. As always “Ozzie” the faithful Border collie and the house cat are the center of attention in the clubhouse. The course itself was crowded, but the pace of play reasonable. A 6 iron from 176 yards on number 18 got me close enough to salvage a par for an 89 on the course, but the round was filled with missed opportunities and a few downright awful shots. But anything under 90 for an opening round of the season, especially with a must make par on 18, was a good way to start the season. Given the late tee time and a scheduled early dinner, I chose to grab a ham and cheese hoagie at the turn. The menu in the snack bar was limited to a couple of sandwich choices, snacks and ¼ lb hot dogs, one of my playing partners chose. The hoagie had plenty of shaved Honey-Baked ham on a fresh bun, which was served warmed at my request. My GDP (golf-dining partner- not some economic indicator) said the hot dog, san the chili, was cooked perfectly and tasty. The beer was a reasonable $3.00, and the food prices in the $4-5 range, and most importantly served by a staff that clearly understands the importance of a client-centric environment. Everyone at Hyland Hills is incredibly friendly and engaged our entire group in conversation; again with Ozzie being the focal point of the interactions. He loves to ride around the course with Bridgett in a golf cart and entertain the golfers in the clubhouse with his quick reflexes as he stalks his rubber chicken or ball. This trip to Pinehurst has been an annual event for many in the group, but just my second trip, and we will play the course again on Wednesday before we leave to return to Northern Virginia. I look forward to trying to best the 89 and visiting again Hyland Hills.